Just made these finger buns today, O….mi…gosh, another recipe from the expert bread maker ThermomummaLailahRose who has published her recipes on her blog thermomumma.com. 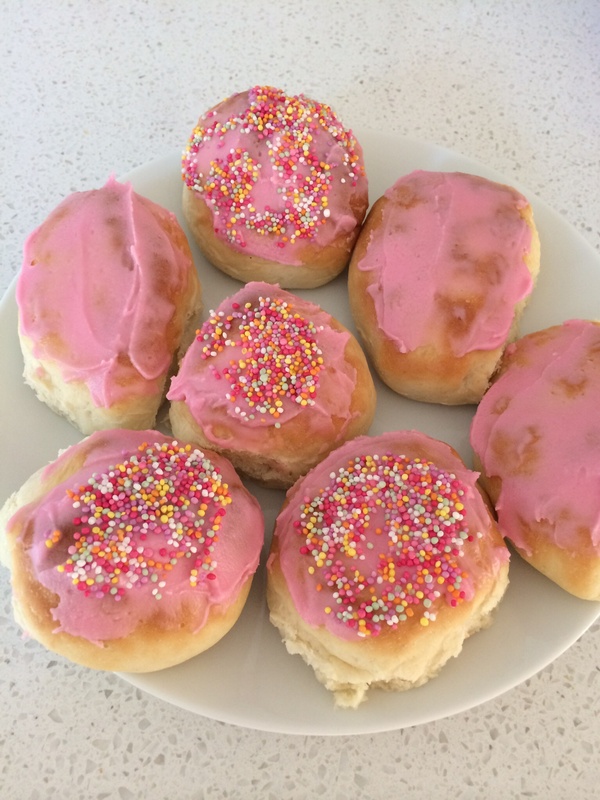 She posted the jumbo white bread( we used for burger buns) , jumbo wholemeal bread, jumbo fruit loaf (used for fruit bun/loaf ) and this absolutely amazing sweet bun dough which can be used for finger buns or scrolls. Awwww I’m giving them away before we eat the lot. They’re as good as the Bakers Delight buns if not better and freshly homemade. And maybe better than our favourite scrolls using Annabel Langbein’s sticky bun recipe. Bread heavan here today! Baked for 10-15 mins at 190C, ( NB trial and error , fan forced too hot for our oven for these buns and buns were too brown and less fluffy ) then iced with her icing recipe on the link above. Oooooooh they’re so good, like eating fluffy pink clouds!!! Going to do cost comparison and post tonight because can’t resist checking out the numbers. Notes for next time: could glaze before baking rather than ice to reduce sugar content and at second prove check at 45 mins, at just over hour looked like they might overprove some were starting to fall.